3DIQ Collapsible Cardboard Viewers, Viewer no longer available but card sets are. Enjoy a neat way to see the world in 3 Dimensions with 3DIQ. 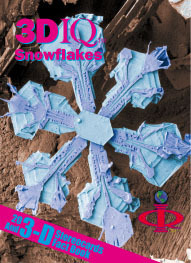 3DIQ Cards are clear undistorted, full color beautiful images that when placed in the 3DIQ Viewer come to life in 3D! Now with lenses! The 3DIQ Gallery Viewer Units come with a set of 20 amazing 3DIQ Cards and a 32 page card sized 3D Fun Factbook. The 20 Gallery images are a sample set of the 12 initial 3DIQ Card sets. Additional 3DIQ sets include 3DIQ African Safari, 3DIQ Butterflies, 3DIQ Kodiak Bears and 3DIQ Snowflakes. The 3DIQ viewer is a mirrored viewer which includes two-sided cards for viewing. The left view is on one side of the card and the right view is on the other side. The viewer sorts out the images and allows for easy viewing. All of 3DIQ's cards can be enjoyed with or without the Viewer. These limited first edition Viewers are individually numbered. Your Viewer comes with the Amazing 20 card Gallery Set and 3D Fun Factbook. The 3DIQ Gallery Set is a sample collection of the first 12 3DIQ Card sets. Enjoy 3D you have to see to believe! These are similar to the above viewers but are cardboard and collapsible for easy mailing. Not as durable but just as fun. Choose one of the galleries below for inclusion with the cardboard viewer! These include lens and front surface mirrors! 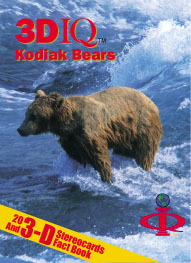 With Kodiak Bears you will experience in 3D the largest carnivores on earth as they go fishing during the annual salmon run. The set contains an educational 3D Fun Factbook and 20 beautiful 3DIQ Cards which can be enjoyed alone or seen in full color undistorted 3D with the 3DIQ Viewer. Witness snowflakes up close and learn why they appear the way they do, in never-before-seen images of 3D snow crystals. The set contains an educational 3D Fun Factbook and 20 beautiful 3DIQ Cards which can be enjoyed alone or seen in full color undistorted 3D with the 3DIQ Viewer. With African Safari you travel on a 3D Safari and explore the land and animals of the African Continent. The set contains an educational 3D Fun Factbook and 20 beautiful 3DIQ Cards which can be enjoyed alone or seen in full color undistorted 3D with the 3DIQ Viewer. So pack your bags and get ready for an amazing 3Dimensional Safari. With Butterflies you will experience a multicolored collection of some of the most beautiful creatures on earth. These 3D images are mosaics of beauty, each portrait a treasure. The set contains an educational 3D Fun Factbook and 20 beautiful 3DIQ Cards which can be enjoyed alone or seen in full color undistorted 3D with the 3DIQ Viewer.